The Air Hogs Hyperactive cars with their plastic rollover hoops look like something out of a sci-fi movie - half spaceship and half vehicle! These gravity-defying cars have an amazing top speed of 22mph. That means that if these tiny cars were scaled-up to real life size they'd be able to go 600mph! The plastic ring ensures that whatever happens, the radio-controlled Air Hogs Hyperactive cars will always land back on their wheels, even after the most terrifying crashes or stunts. With an enormous control range of 150 feet, kids will never lose track of their ultimate speed machine. Any number of Hyperactive vehicles can have a simultaneous race thanks to the latest developments in 2.4GHZ RC technology. 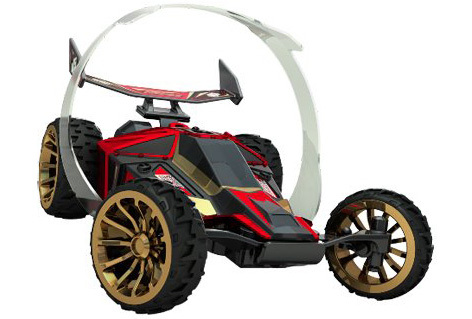 The special tyres fitted to the Air Hogs Hyperactive vehicles can be easily swapped between rubber or foam which means they can be used effectively indoors as well as out. These palm-sized cars reach insane speeds and the lipo battery can be quickly recharged from the trigger style hand controller in just five minutes. Please tell us what you think of Air Hogs Hyperactive by Spin Master and Spin Master.